Are you a palm oil producer and are you looking for a testing system that allows you to monitor the quality of your oil right in the production plant? Do you use palm oil as a cooking oil and shortening? Are you the owner of a palm oil refinery? We have designed the analysis system for quality control of crude and refined palm oil that is most appropriate for your business: it’s CDR PalmOilTester, specifically devised to perform chemical analyses easily and rapidly. CDR PalmOiltester is compact and handy and can be used in any environment: either in a laboratory, or at the production plant, or upon sale/purchase of the product, thus improving production efficiency and the profitability of your business. Fast and intuitive, it provides results that are correlated with the reference methods. Solutions for Palm Oil analysis was last modified: May 16th, 2017 by CDR s.r.l. Warm up palm oil since it is semi-solid at room temperature. 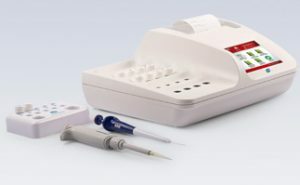 Use the supplied pipette to add the correct volume of reagent and then of sample. Then shake. The displayed instructions will help the operator step by step. The result of the test is automatically calculated, displayed and printed in just a few minutes. Unlike NIR systems or other types of photometers, no complex and regular calibration procedures are required: the device is either supplied pre-calibrated, or a customized calibration can be carried out in a rapid and easy way. The system does not require costly spare parts: our analyzers exploit state-of-the-art LED emitters and do not therefore require the maintenance that is usually needed for photometers using tungsten lamps. Moreover, the absence of moving parts eliminates the risk of damage. The PalmOilTester system and its analytical methods have been tested in the course of comparative trials carried out by several institutions, such as Indelab sdn. Bhd. Malaysia, Member Analyst to FOSFA INTERNATIONAL. The trials gave evidence of an excellent correlation of the results with the AOACS official methods. CDR PalmOilTester is a true analysis laboratory. We have developed it to perform easy and fast chemical analyses even on the production line without the support of personnel with specific lab tech experience. CDR PalmOilTester fine tunes traditional testing methods, making them faster and easier, while guaranteeing accuracy standards in line with the ISO/AOCS reference methods.